Never having met Squishy McFluff before, this was my first foray into this invisible cat’s world. 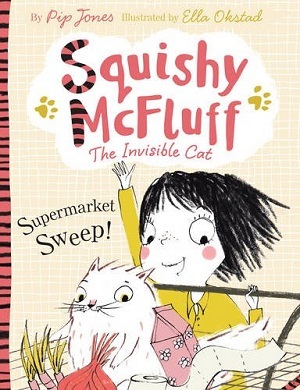 Supermarket Sweep is the second book, about Ava’s trip to the supermarket with her mum and her invisible companion cat. A third book called Squishy McFluff Meets Mad Nana Dot was published this week. Squishy McFluff is narrated entirely in rhyme and I was captured from the rhyming introduction, which asks the reader to imagine Squishy. It turns out Squishy is a very naughty cat, who leads his owner, Ava, into all kinds of scrapes and trouble, with a mischievous glance at the reader. I loved the relationship between Ava and her mother, I loved the modern references to objects such as mobile phones, and also the fact that Pip Jones certainly knows her audience as she understands what’s appealing to children – Ava will visit the supermarket on the premise that she can ride in the trolley. It is reminiscent of The Cat in the Hat – but only the more pleasing for being so. This is also perfect material for a child looking to start reading independently – the rhyming helps a young child to figure out which word is coming next, and the vocabulary is not too taxing. The book is also split into small chapters, which is helpful if you’re a struggling reader. It’s funny and endearing with superbly fitting illustrations from Ella Okstad. More please.